1891. G. P. Mills with P. C. Wilson, A. Brundrett, Rene de Knyff, A. Lambert, H. O. Duncan, Felix Greville, P. L. Renouf, L. Stroud, Major Knox-Holmes, M. D. Rucker and Captain de Bruno Holmes. June 1904. Motorcycle record for Land's End to John o'Groats in 50h. 46m. 30s. Beating previous records held by J. Silver and E. H. Arnott. 1871 Living at Bidford Hill Road, Streatham: William Dowries Mills (age 30 born Hereford), Market Clerk and Manager to a Firm of Cotton (?). With his wife Charlotte Elizabeth Mills (age 30 born Rio de Janeiro - British subject) and their children George Pilkington Mills (age 4 born Paddington) and William Frederick Mills (age 1 born Balham). Also his widowed mother-in-law Charlotte Clara Pilkington (age 70 born Blackheath, Kent). Two servants. 1881 George P. Mills (age 14 born Bayswater) is a boarder at the "School", Redland Hill House, Redland Road, Westbury-on-Trym. 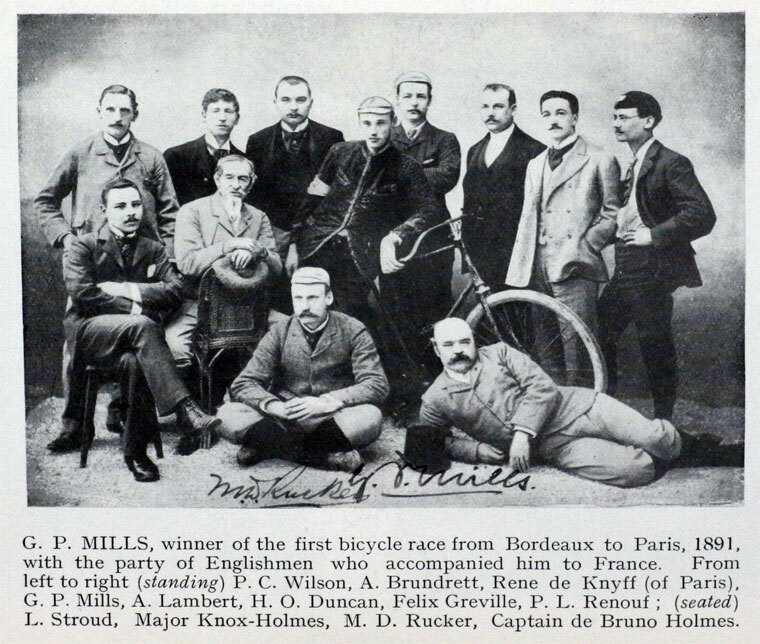 1884 Mills joined the Anfield Bicycle Club, in Liverpool, five years after it was formed. He was a founding member of the North Road Cycling Club in London. At his death on 8 November 1945, he was one of only two founding members still alive. The other was E. P. Moorehouse. With Mills dead and Moorehouse ill, the club cancelled presentations to mark their achievements and their long association. 1886 G. P. Mills of the Anfield Bicycle Club took only 5 days and 10 hours to cycle from Lands End to John O'Groats, a distance of 861 miles  5 days and 1.75 hours  He rode a penny-farthing from Land’s End to John O’Groats in 5 days. Fellow Anfielders, who knew the roads, helped with the record-attempt. They organised accommodation and food, and ensured that local clubmen guided him along the way. 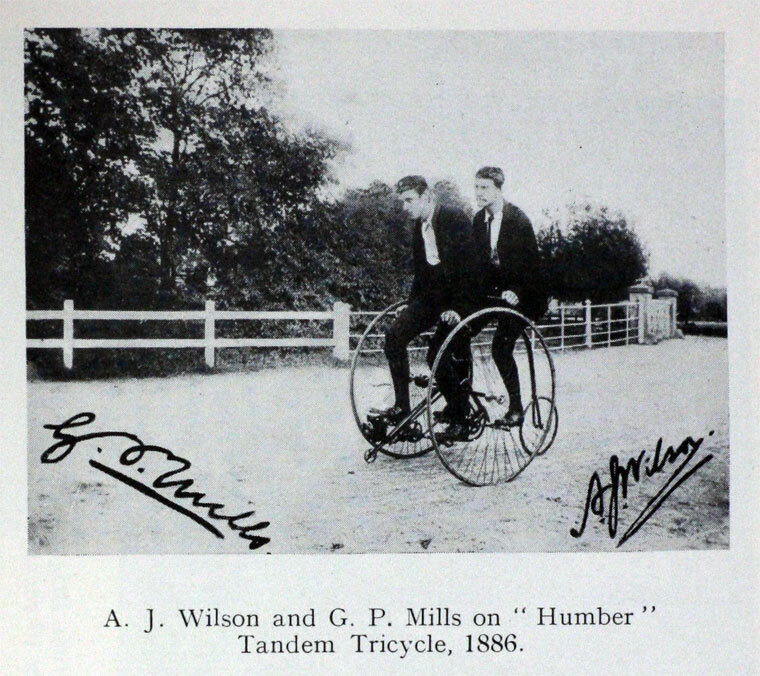 Mills rode day and night, snatching little sleep, and his record for a penny-farthing was never bettered. 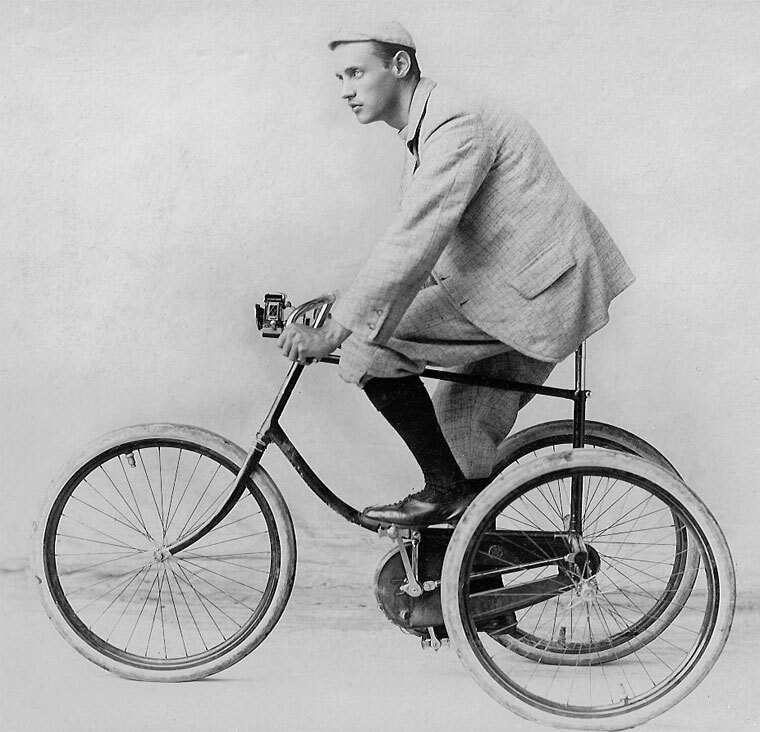 During the next 15 years he took up the "end to end" challenge time after time, holding the record on the first modern bicycles, tandems, and tricycles. 1888-1890 Designer and manager at Mills and Gamble Cycle Works, Biggleswade, where he designed a tricycle and a safety bicycle. 1891 Visitor at 17 The Grove, Clapham, the home of Thomas K. Holmes (age 83 born Chichester), a Retired Major in the Army. With his son Tom B. Holmes (age 37 born St. James, London), a Captain in Volunteer Force. Also a visitor George P. Mills (age 24 born Bayswater), a Civil Engineer. Two servants. 1893 June. LEJOG record. Tricycle record in 3 days 16 hours 47 minutes. This beats the previous bicycle record. 1894 May. Breaks record for Edinburgh-London in 29 hours 28 mins. 1894 June. LEJOG record. Completes in 3 day 5 hours and 45 minutes. 1896 G. P. Mills A.M.I.C.E. appointed Works Manager at Raleigh. Formerly Chief Designer at Humber at Beeston. By the end of the 1890s he was regarded as the greatest long distance rider the world had ever seen. He set many long distance records including seven in one season. 1899 Mentioned as having designed a frame for Raleigh. 1901 Living at The Woodlands, Broadgate, Beeston: George P. Mills (age 34 born Bayswater), a Civil Engineer. With his wife Mary A. S. Mills (age 35 born Biggleswade) and their son Leslie P. Mills (age 3 born Beeston). Two servants. 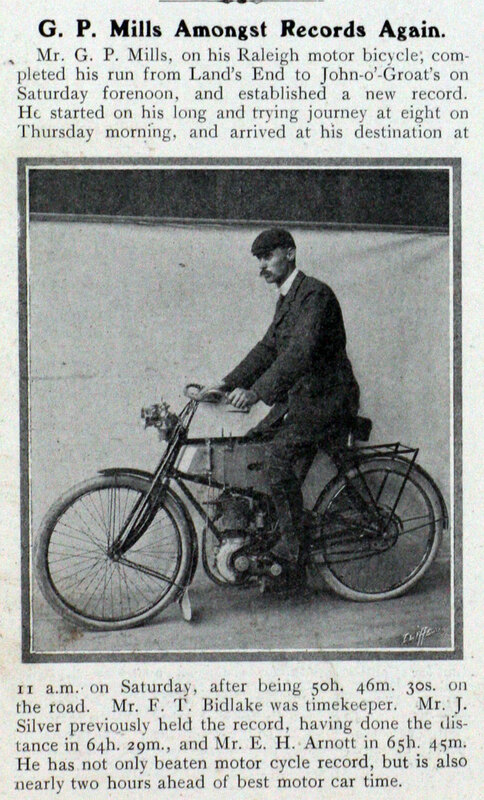 1907 He was working at Beeston, home of the Raleigh company. 1909 Appointed works manager of Clement-Talbot. 1914 He volunteered for the army again and in March 1915 was stationed at Colchester. He was a captain in the Bedfordshire regiment. He left for France in December 1915 and by 1917 had been promoted to lieutenant-colonel. He was awarded the Distinguished Service Order and he was mentioned in dispatches three times. 1910 Moved to west London to join Clement Talbot. It was from there that he joined the army. Post WWI. He worked for the Aster Engineering Co in Wembley after the war He became director of the small arms and machine gun department of the Ministry of Munitions after 1918. He joined the Home Guard in the second world war. 1924 Worked at Belsize Motors in Manchester. From 1938 until he died he lived at Shirley, in Surrey. "Lt.-Colonel GEORGE PILKINGTON MILLS, D.S.O., whose death occurred on 25th November 1945, was one of the pioneers in the early days of the cycle industry, his association with which dated back to 1887. He also had extensive experience in the design and manufacture of motor cars. He was born in 1867 and educated at Clifton College, at Whitgift Grammar School, Croydon, and Liverpool University College. After serving his apprenticeship with Messrs. A. B. Fraser and Company and Messrs. David Rolls and Sons, Ltd., marine engineers, of Liverpool, from 1884 to 1887, he received his first employment as a draughtsman at the Ivel Cycle Works, Biggleswade. Subsequently he became works manager with responsibility for design to Messrs. Mills and Gamble, cycle manufacturers, of the same town. In 1890, he accepted the same position with the Humber Cycle Company, of Beeston, Notts., and was largely instrumental in effecting considerable improvements in the design of that company's machines. Four years later he joined the Raleigh Cycle Company, of Nottingham, as works manager, where his capacity for design found expression in the construction and equipment of a new factory for that company at Lenton, Notts., at that time the largest in the world and capable of accommodating some 4,000 employees. He relinquished this appointment in 1907 and successively filled similar positions with the Humber and Talbot motor companies. During the war of 1914-18 Colonel Mills commanded the 7th Battalion of the Bedfordshire Regiment and the 54th Infantry Brigade in France and Belgium, receiving the award of the Distinguished Service Order and three mentions in despatches. He was further responsible for the organization of equipment and staff for the National Machine Gun Factory at Burton-on-Trent in 1918, where for three years he was in control as superintendent. Subsequently he filled positions as manager of the radiator department of the Austin Motor Company, works manager of the Aster Engine Company, and works director of Belsize Motors, Ltd. In 1929 he became managing director of the Western Viscose Co, of Bristol, but two years later he returned to the Austin Motor Company as service station inspector and subsequently acted in the same capacity for Armstrong Siddeley Motors, Ltd.
During the 1939-45 war he was an inspector for Messrs. Creeds, Ltd., of Croydon, instrument manufacturers. Colonel Mills had a long record of service with the Territorial Army, in which he took a keen interest, retiring in 1909 with the rank of major. He had been a Member of the Institution for nearly half a century, having been elected in 1898. He was the holder of numerous patents and registered designs relating to cycles and machinery for their manufacture. ↑ Cycling. The Badminton Library. Viscount Bury and G. Lacy Hillier. 1889.